Ravi Philemon kicks off TOC's National Day Week. We apologise for the accessibility problems you have been facing the last two days or so. We’ve had problems with our servers. Do visit our Facebook page for updates if this should happen again. The mere thought of “We the people of Singapore” paints a mental picture of strength in unity; and is truly empowering. But is true power merely an illusion for the ordinary Singaporean? Is true power reserved only for the select few? What is the privilege of being “we the citizen of Singapore” for the thousands who turn up at the free meal centres, only to be turned away? What is the value of being “we the citizen of Singapore” for the likes of Peter and Sarah, the “new poor” for whom even the basic needs of a home remain a distant dream? How many continue to live in darkness with water taps barely trickling because they could not pay the power companies? 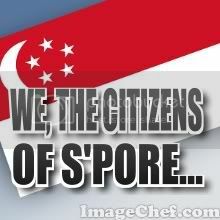 What is the point of being “we the citizen of Singapore” for them? For Sarah, a five-year old, whose pre-school education was disrupted because she could not pay the kindergarten fees, what is the use in being “we the citizen of Singapore”? For people like Rezal who might be made criminals because they want to ‘put bread on the table’ for their families, what does being “we the citizen of Singapore” hold? Why would the disabled like John and Ryan even identify themselves as “we the citizens of Singapore”, when they continue to remain at the mercy of transportation companies even for the basic right of affordable public transportation? No wonder most ordinary Singaporean suffer from anterograde amnesia in remembering that we are indeed the citizens of Singapore. Ms Veena Bharwani, reporting in an article titled “Will you take the pledge?” in the New Paper , says that “it was disappointing but not surprising” that in a street survey of 100 people to gauge how well a Singaporean between the ages of 20 and 70 would know the National Pledge, “41 did not know the pledge at all and another 24 stumbled on the words. Only 35 could recite it without stuttering”. But yet 65% of Singaporeans have seemingly forgotten the pledge which they had recited almost everyday, for at least 10 years of their lives from the ages of 6 to 16! It certainly looks like the pledge for these at least, is mere rhetoric. Have the people forgotten the social promise, the national pledge, because the government itself is amnesiac of its social responsibility – the social welfare of the ordinary Singaporean? There is no Department of Social Welfare in Singapore. Social Welfare was discarded for upstream measures and community development. And even the community development is mixed in with youth and sports. Words like “social welfare” and “welfarism” still remain dirty in Singapore; and the whole government propaganda machinery is unleashed against the development of a ‘welfare state’ and a ‘welfare mindset’. How can the needy remember the power of “we the citizens of Singapore”?